Unified land operations is the Army’s operational concept and the Army’s contribution to unified action. By integrating the four foundations of unified land operations—initiative, decisive action, Army core competencies, and mission command—Army commanders can achieve strategic success. All Army operations aim to seize, retain, and exploit the initiative and achieve decisive results. Army forces demonstrate the Army’s core competencies through decisive action—the continuous, simultaneous combinations of offensive, defensive, and stability or defense support of civil authorities tasks. In unified land operations, commanders seek to seize, retain, and exploit the initiative while synchronizing their actions to achieve the best effects possible. Operations conducted outside the United States and its territories simultaneously combine three elements—offense, defense, and stability. Within the United States and its territories, decisive action combines the elements of defense support of civil authorities and, as required, offense and defense to support homeland defense. Decisive action begins with the commander’s intent and concept of operations. As a single, unifying idea, decisive action provides direction for the entire operation. Based on a specific idea of how to accomplish the mission, commanders and staffs refine the concept of operations during planning. They adjust it throughout the operation as subordinates develop the situation or conditions change. 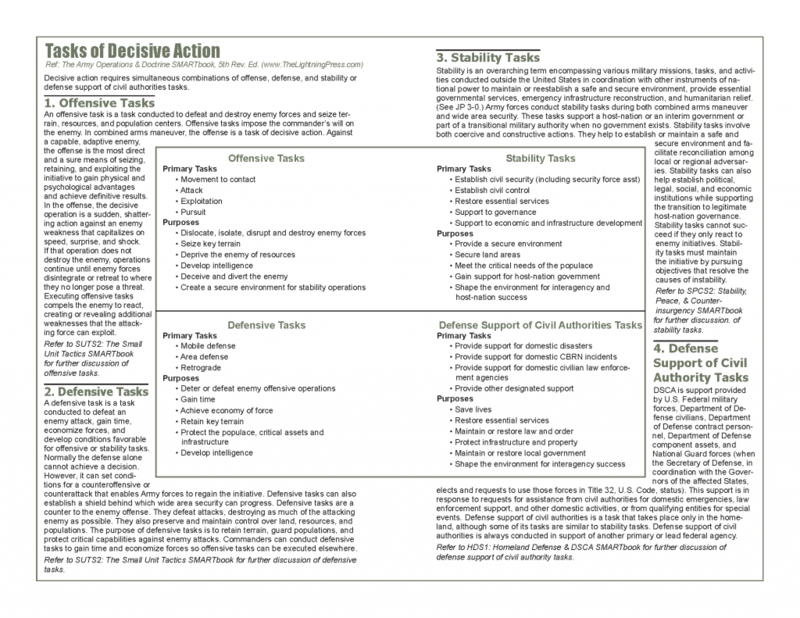 Conducting decisive action involves more than simultaneous execution of all its tasks. It requires commanders and staffs to consider their units’ capabilities and capacities relative to each task. Commanders consider their missions, decide which tactics to use, and balance the tasks of decisive action while preparing their commander’s intent and concept of operations. They determine which tasks the force can accomplish simultaneously, if phasing is required, what additional resources it may need, and how to transition from one task to another. Army forces demonstrate the Army’s core competencies through decisive action—the continuous, simultaneous combinations of offensive, defensive, and stability or defense support of civil authorities tasks. An offensive task is a task conducted to defeat and destroy enemy forces and seize terrain, resources, and population centers. Offensive tasks impose the commander’s will on the enemy. In combined arms maneuver, the offense is a task of decisive action. Against a capable, adaptive enemy, the offense is the most direct and a sure means of seizing, retaining, and exploiting the initiative to gain physical and psychological advantages and achieve definitive results. In the offense, the decisive operation is a sudden, shattering action against an enemy weakness that capitalizes on speed, surprise, and shock. If that operation does not destroy the enemy, operations continue until enemy forces disintegrate or retreat to where they no longer pose a threat. Executing offensive tasks compels the enemy to react, creating or revealing additional weaknesses that the attacking force can exploit. Refer to SUTS2: The Small Unit Tactics SMARTbook for further discussion of offensive tasks. A defensive task is a task conducted to defeat an enemy attack, gain time, economize forces, and develop conditions favorable for offensive or stability tasks. Normally the defense alone cannot achieve a decision. However, it can set conditions for a counteroffensive or counterattack that enables Army forces to regain the initiative. Defensive tasks can also establish a shield behind which wide area security can progress. Defensive tasks are a counter to the enemy offense. They defeat attacks, destroying as much of the attacking enemy as possible. They also preserve and maintain control over land, resources, and populations. The purpose of defensive tasks is to retain terrain, guard populations, and protect critical capabilities against enemy attacks. Commanders can conduct defensive tasks to gain time and economize forces so offensive tasks can be executed elsewhere. Refer to SUTS2: The Small Unit Tactics SMARTbook for further discussion of defensive tasks. Stability is an overarching term encompassing various military missions, tasks, and activities conducted outside the United States in coordination with other instruments of national power to maintain or reestablish a safe and secure environment, provide essential governmental services, emergency infrastructure reconstruction, and humanitarian relief. (See JP 3-0.) Army forces conduct stability tasks during both combined arms maneuver and wide area security. These tasks support a host-nation or an interim government or part of a transitional military authority when no government exists. Stability tasks involve both coercive and constructive actions. They help to establish or maintain a safe and secure environment and facilitate reconciliation among local or regional adversaries. Stability tasks can also help establish political, legal, social, and economic institutions while supporting the transition to legitimate host-nation governance. Stability tasks cannot succeed if they only react to enemy initiatives. Stability tasks must maintain the initiative by pursuing objectives that resolve the causes of instability. Refer to TAA2: The Military Engagement, Security Cooperation & Stability SMARTbook, 2nd Ed. for further discussion of stability tasks. DSCA is support provided by U.S. Federal military forces, Department of Defense civilians, Department of Defense contract personnel, Department of Defense component assets, and National Guard forces (when the Secretary of Defense, in coordination with the Governors of the affected States, elects and requests to use those forces in Title 32, U.S. Code, status). This support is in response to requests for assistance from civil authorities for domestic emergencies, law enforcement support, and other domestic activities, or from qualifying entities for special events. Defense support of civil authorities is a task that takes place only in the homeland, although some of its tasks are similar to stability tasks. Defense support of civil authorities is always conducted in support of another primary or lead federal agency. Refer to HDS1: Homeland Defense & DSCA SMARTbook for further discussion of defense support of civil authority tasks.